My children’s ethnic ancestry is five-eighths Yiddish: All of their father’s grandparents, and my maternal grandfather, were descendants of Eastern European Jews. We aren’t Jewish–my ten-year-old son Nicholas and I are Episcopalians, we’re bringing baby Lydia to church with us, and my partner Daniel does not practice any organized religion–but Jewish/Yiddish customs are an important part of our family background. Daniel’s grandfather, Herschel, is 99 years old and still hosts a Passover seder in his home. I’d never been to a seder before I started living with Daniel. Now it’s our annual connection to our Yiddish roots, and I missed it very much the few years we weren’t able to attend. Daniel’s mother always comes to spend Passover with her father, and she makes the dinner. Family friends, the Feldmans, come over for the seder and bring dessert. We don’t make it as formal and reverent as we could, but we all respect the basic structure of the ritual and try to follow the traditions. Nicholas was three months old at his first seder. He sat calmly in my lap and even slept through part of it. Of course he doesn’t remember it. He was too young to sample any of the food. But it was very special to all of us that he could participate in this family tradition with his great-grandfather. (An extra bonus was that my brother happened to be in town that spring, so he got a chance to attend the seder, too, and to meet Daniel’s extended family.) Herschel exclaimed many times how glad and amazed he was to be a great-grandfather. Although he knew we wouldn’t be raising Nicholas as a Jew, still we were welcome at the seder table. 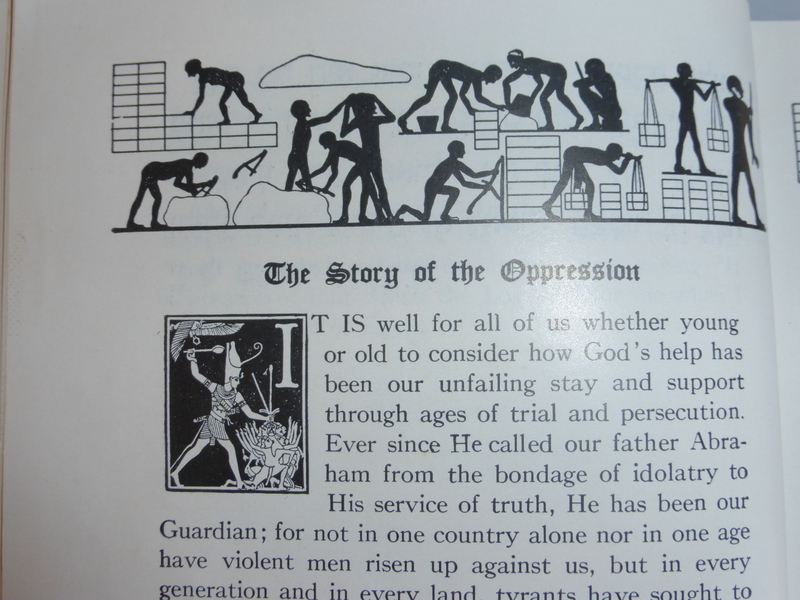 Over the years, Nicholas understood more of the Passover story: Our ancestors were slaves in Egypt, and when they decided to leave, they had a bunch of adventures! We are grateful to God for guiding them through all those difficulties so that we can be here today. We remember our brave ancestors and celebrate the coming of spring with this ritual and these ceremonial foods. He was three years old when he recognized that this story also is part of our Easter Vigil service at church and that we hear parts of it in church at other times of year. At five years old, he noticed that the Gospels say the Last Supper was a Passover meal; celebrating Passover is totally appropriate for Christians as well as Jews. His parents, grandmother, and great-grandfather all have enjoyed watching Nicholas grow old enough to read the Four Questions and to hunt for the Aphikomen–a matzoh wrapped in a napkin that is hidden somewhere in the house at one point in the seder for the child(ren) to find at a later point. None of us expected that Daniel and I would have another baby in our forties or that, if we did, Great-grandpa would be still alive to know her–but here they are! Herschel and Lydia each took their first unsupported steps in the week before the seder (his were the first since an injury last summer) so they had something in common. “Imagine knowing someone so much younger than me!” Herschel marveled. He can remember when radio broadcasts began! Each year we have together is a blessing. Lydia was eleven months old at her first seder. She sat in a high chair and was rowdier than I would have liked, but we got through it, and she loved the food! She ate matzoh, hardboiled egg, date charoses (the apple kind is too crunchy, since she doesn’t have teeth yet), matzoh ball from the soup, gefilte fish, asparagus, and strawberries. (The asparagus and strawberries aren’t traditional Jewish foods, but they’ve become traditional at this seder because they are springtime foods.) We didn’t offer her any horseradish! 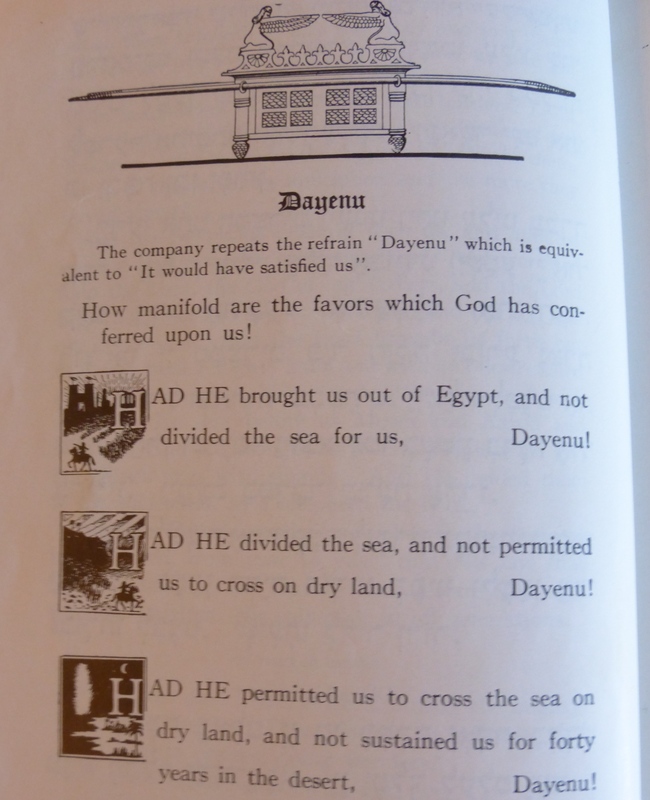 We read the seder from The Union Haggadah, published in the 1920s and used by Herschel’s family ever since. I love the illustrations and the feeling of reading from the same books that have been used for generations. There are some parts that just give me chills. Why is this night different from all other nights? Each year, this night is similar to last year’s seder and many years before, but this night finds us all slightly different than we were or will be in any other year. We Do This. These are the traditions of our people. We do not change them for the children. 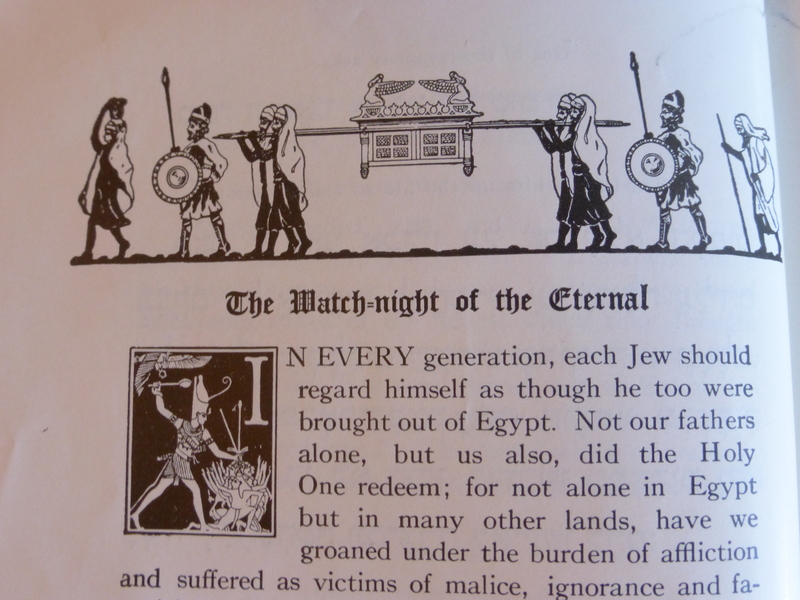 The Haggadah includes many references to suffering, slavery, plagues, even a casual mention of “The Angel of Death”–which Daniel always says in a spooky voice. When the leader reads, “Let us now say grace,” all the rest of us pipe up, “Grace!” I think this was the first year Herschel didn’t chuckle about how silly he feels saying, “Lo! This is the bread of affliction…” (That was probably because he bowed out of the role of leader this year, so Daniel’s mother was reading that part.) There are dark parts and fun parts to the seder, and there are parts we always skip to save time, and it’s not a singing family so we just chant the parts that could be sung–and all of that is the same now as at the half-dozen seders when I was the youngest person present. Nicholas squirmed a bit when he was one and two years old, and he spent some of the time playing under the table, but he was there through the whole thing. We expect Lydia to do the same. After all, they are part of the family. The seder doesn’t make me want to start observing Judaism, but it makes me feel more connected to the Jewish part of my heritage–which is an even larger part of my children’s heritage. My two great-grandparents whose lives overlapped with mine were the two Yiddish ones, but I never did any Jewish activity with them; now I feel a little closer to them because I know a little more of what was familiar to them. I’m glad that my children get to participate in this family tradition. They Come Through You — Aspen at Aspen Mama shares what her late-discovery adoption means to her and her family. The Shape of Our Family: Musings on Genealogy — Donna at Eco-Mothering delves into her genealogy and family stories, observing how the threads of family reveal themselves in her daughter. Hand family stories down to the next generation — Lauren at Hobo Mama asked her father to help her son learn to read — never expecting that Papa’s string of richly storytelling emails would bring a treasure trove of family history into their lives. Saving Family Stories — Holly at Leaves of Lavender talks about why she thinks it’s important to preserve fun and interesting family stories for future generations. Serenading Grandma — When Dionna at Code Name: Mama started playing violin in the fifth grade, her grandma and mother were the biggest part of her musical cheering section. Her grandma urged her to keep playing and reminded her that someday she’d be thankful for her talent. As was so often the case, her grandma was right. Family legacy ambivalence — With a family history of depression and suicide, Jessica at Crunchy-Chewy Mama frets about her children’s emotional health. 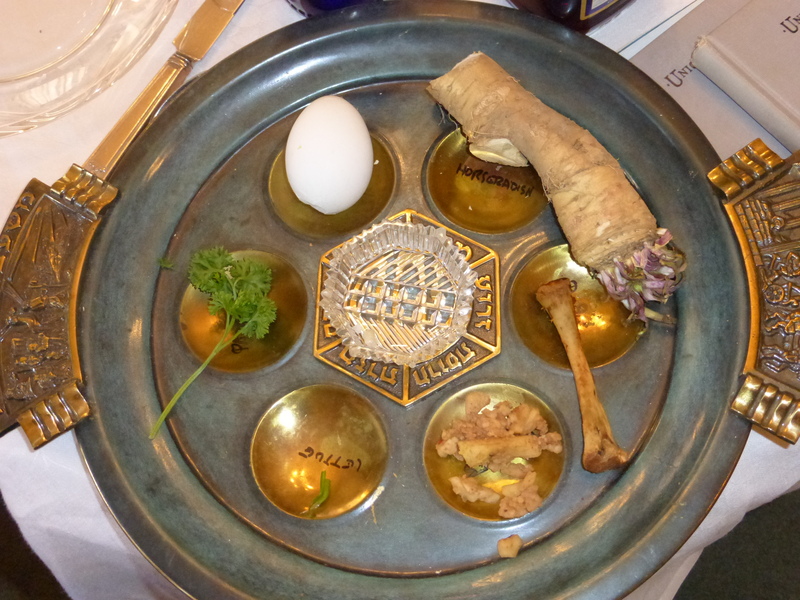 Seder and Holy Week: Family Traditions, Old and New — As an Episcopalian whose children’s ancestry is five-eighths Jewish, Becca at The Earthling’s Handbook values the annual Passover seder that connects her and the kids to family traditions. Visit Works-for-Me Wednesday to see what’s working for other families! thank you for another beautiful post. you are a light in my world. the link for this blog post doesn’t work and i’ve had no success trying to find the article through other googling. i’m very interested to read it. can you help out? – *“They Come Through You” * — Aspen at *Aspen Mama* shares what her late-discovery adoption means to her and her family. I will receive corrected links for the carnival later today and update the post. Sorry–it’s so frustrating when you want to read something and can’t get to it! Thank you so much for sharing! How nice to have this connection and these (new) memories with your family. My family turned away from the Catholic church well before I was born so I grew up without a faith tradition. I attended lots of Bat and Bar Mitzvahs, though, and realized then how big a role ritual played in many people’s lives! My son is asking bigger questions and also is curious about faith so I think we are going to finally start going to the Unitarian church so he can learn and have some grounding. I was drawn to Waldorf school and its seasonal celebrations and rituals, but we are now in public school and I’ve got to start cultivating reverence in the home! Becca – I think it is wonderful that your children’s lives are so steeped in tradition. My husband and I were both raised in Christian homes (for the most part), but we are no longer practicing. I’ve been missing a faith community, and so we are trying a UU church. I want to expose our kids to a variety of beliefs, so that they will respect and appreciate many traditions and religions. Thank you for sharing yours! I was raised UU. It definitely is a good way to learn about a variety of beliefs; whether they are respected and appreciated depends on the individual congregation and how ideas are presented. I sought out The Episcopal Church as a teenager because I was looking for more structure, for a group of people who wouldn’t just say, “You can believe whatever you want!” but would actually admit to believing something and tell me what it was. There’s still some freedom in exactly what specifics to believe and how to practice (when to kneel, whether to attend all the Holy Week services or only some, etc.) but I’m a person who appreciates having a creed. I love the Yiddish traditions you keep alive throughout so many generations. And it seems to have feeling it it, too. I grew up Catholic and we had family traditions of going to Mass, gathering for a cousin’s First Communion, etc. However, they felt kind of by rote, more “this is what we’ve always done and don’t question it” instead of the rituals having any deeper meaning to our family — especially nothing that we ever discussed. That sounds lovely. I’ve always been drawn to Jewish customs and even took a Judaism course in college, even though, as far as I know, we have no Jewish heritage. I think it was the connection with my Christian beliefs that made me want to learn more about that spiritual heritage. I love hearing about the Seder practices. It’s so wonderful that you can connect with your own and your children’s ancestors through such a meaningful ritual. Herschel’s involvement at 99 is quite touching — how marvelous that he’s gotten to meet both your children. My last surviving grandparent (and Sam’s were already gone by then) got to meet our firstborn as a baby, and then that was all. I try to remember to tell my children stories of them. I love this. I have never attended a seder, but I’d like to. To be honest, I never thought about it until my brother went to one. As soon as he told me about it, it dawned on me that I should learn more about Passover and do the same. Thanks for linking up to Works for Me Wednesday! Thanks! It really is a great thing to do during Holy Week. (Passover usually overlaps with some part of the week before Easter.) Our seder was on Saturday this year, so we went straight from there to Easter Vigil. Other years we have gone from Palm Sunday church to the seder, or it was on Maundy Thursday (the night Jesus celebrated Passover=Last Supper) or Good Friday. It works for me in any of those timings.